The CSCTA Coach Grant Application form is now available. 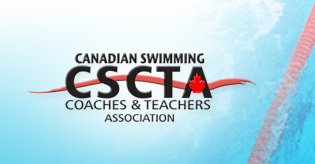 The Annual General Meeting of the Canadian Swim Coaches and Teachers Association will be held in Etobicoke, Ontario on Friday the 25th day of November 2011. SNC has posted the qualifying Time Standards for the 2011-2012 season. Meet information for the 2011 Canada Cup - Toronto is now available online at www.swimming.ca. A reminder to all Coaches who are currently working for a club affiliated with Swimming Canada.